YOUTH PROGRAM AT THE DAYLE MCINTOSH CENTER IS A SUCCESS! Photo description: A group of seven youth with various types of disabilities/gender/racial and ethnic identities smiling and posing for a photo. The Dayle McIntosh Center (DMC) in Anaheim has recently partnered with the City of Anaheim and received a program grant from the Department of Rehabilitation to serve youth. Collaboration with other entities involved with youth programming has greatly boosted effectiveness of DMC’s youth program. The City of Anaheim, local school districts and transitional programs, Regional Center and the Department of Rehabilitation have all provided referrals and support. Anaheim has made it possible for MY BEST to move into donated space that includes kitchen facilities and an outdoor area. Outreach in the community, especially sharing flyers with Regional Center, has created a huge influx of new youth consumers. A Youth Advisory Committee (YAC) was formed in October of 2017 to ensure that programs are truly youth driven. 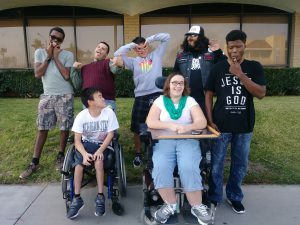 The YAC is composed of five youth with various disabilities who have either been long–time members of the youth program or have shown great insight and leadership potential. The Youth Advisors meet with DMC Staff on a monthly basis to provide constructive feedback and suggestions. Through the advice of the YAC, arts and crafts were added to the LOL format, new ideas have been recommended for lesson planning, and a youth advisor and youth outreach coordinator co-facilitate the Youth Peer Support group. Think outside the box. Look at your community and partners you currently work with to see how the resources and relationships can support your youth program. If your center doesn’t have the space for a youth group, approach a local city to see if you can use their community center or a local church that may let you use their space. Assess your community to see what other agencies you might build partnerships with that might add great valueand support to your programming. Find youth who want to give input. They will give you honest feedback about whether or not things are working. If their voices are heard, they will come back and bring friends! One Response to YOUTH PROGRAM AT THE DAYLE MCINTOSH CENTER IS A SUCCESS!